Delta’s first Airbus A350, Ship 3501, left Airbus’ paint shop in Toulouse, France, on Tuesday June 13, 2017 coated in Delta’s signature livery as the aircraft prepares to be delivered in July. This entry was posted in Delta Air Lines and tagged A350, A350-900, A350-941, Airbus, Airbus A350, Airbus A350-900, Delta Air Lines, F-WZGP, N501DN on June 14, 2017 by Bruce Drum. China Southern Airlines has signed a purchase agreement with Airbus for 20 A350-900s, becoming the latest customer for the aircraft. This entry was posted in China Southern Airlines, Uncategorized and tagged A350, A350-900, Airbus, Airbus A350, Airbus A350-900, China Southern Airlines on April 27, 2017 by Bruce Drum. On February 24, 2017 Lufthansa welcomed its second Airbus A350-900 to the Munich base. Flight LH 9921 from Toulouse landed at around 11:00 at Munich Airport. There was also a special welcome from the airport’s fire service who received the new Airbus with a ceremonial fountain of water (below). Captain Georg Obermaier carried out the transfer flight from the Airbus works in Toulouse and is full of enthusiasm for the newest member of the fleet. The flight crew completed their first training flights from the northern runway at Munich Airport to Leipzig. After a short interim stop, the A350-900 continued on to Cologne where it is pictured, where it landed for the first time at around 15:00. The new aircraft has capacity to carry 293 passengers – 48 passengers in Business Class, 21 in Premium Economy Class and 224 in Economy Class. The A350-900 is currently the world’s most advanced and most environmentally-friendly long-haul aircraft. It uses 25 percent less kerosene, produces 25 percent fewer emissions and is significantly quieter on take-off than comparable types of aircraft. On March 14, 2017, the second A350-900 will take off for Boston as its first flight in scheduled service. 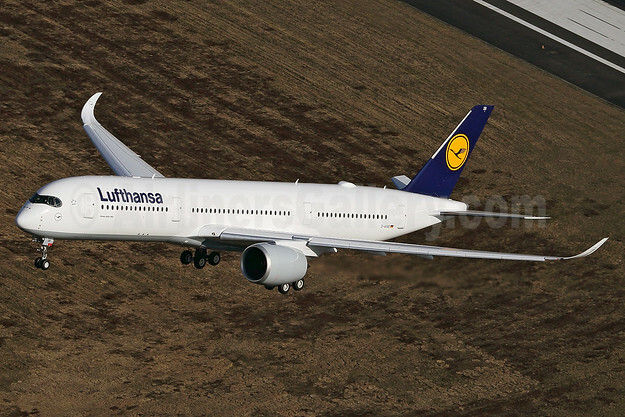 Copyright Photos: Lufthansa Airbus A350-941 D-AIXB (msn 080) CGN (Rainer Bexten). Image: 937081. This entry was posted in Lufthansa and tagged A350, A350-900, Airbus, Airbus A350, Airbus A350-900, Airbus A350-941, CGN, D-AIXB, Lufthansa, msn 080 on February 26, 2017 by Bruce Drum. Air Lease Corporation (AL) has announced the placement of one Airbus A350-900 wide body jet on long term lease to Sichuan Airlines (Chengdu, China). The aircraft will be delivered in the first quarter of 2019 from ALC’s order book with Airbus. The A350-900 will be primarily operated across the Pacific, linking major cities in China with USA and Canada. Sichuan will be leasing three Airbus A350-900s through AerCap and now one through ALC. Sichuan Airlines has leased Airbus A330-200, A330-300, A319, and A321 aircraft from ALC. Later this year, Sichuan will receive the first A320neo and A321neo leased into China from ALC. This entry was posted in Sichuan Airlines and tagged A350, A350-900, Airbus, Airbus A350-900, Sichuan Airlines on January 3, 2017 by Bruce Drum. Lufthansa has taken delivery of its first A350 XWB, the pictured A350-941 D-AIXA (msn 074). The new type is pictured arriving back at Toulouse on December 21, 2016 after a training flight. 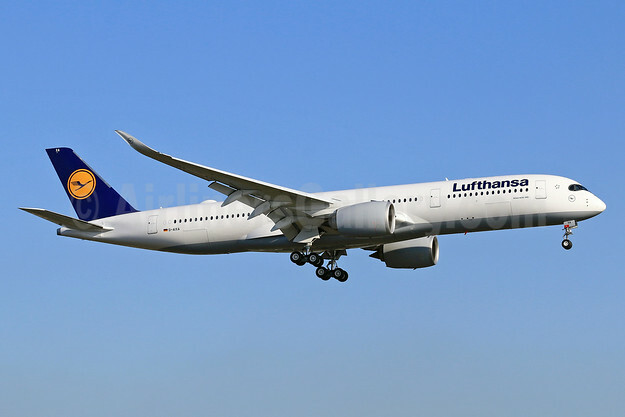 The aircraft is the first of 25 A350-900s that Lufthansa has on order. Lufthansa will deploy their first A350s on long-haul routes from Munich to Delhi and Munich to Boston. Powered by Rolls-Royce engines, Lufthansa’s A350 XWB will feature a comfortable three-class cabin layout with 48 seats in Business, 21 seats in Premium Economy and 224 seats in Economy. The A350 XWB is equipped with Lufthansa’s latest cabin products including new seats, an all-new inflight entertainment experience and, for the first time, inflight connectivity, offering new levels of comfort and convenience to Lufthansa’s passengers in all classes. It is one of the most important events for the year for the Lufthansa Group: The first Lufthansa Airbus A350-900 landed at its home airport of Munich airport on December 21, 2016. With a total of ten aircraft, Lufthansa stations the world’s most modern long-haul fleet at the Munich hub. For the cabin crew who brought the A350-900 to Munich, the event is also “a milestone that makes us very proud”, says flight attendant Annika Wittmann. Flight LH 9921 from Toulouse landed on the southern runway, and was greeted by the fire brigade spraying arches of water as a welcome. There was a Lufthansa Christmas angel on board, Lufthansa employee Anja Oskoui, who had a special something in her suitcase: She gave a 10,000 euro cheque to a Munich orphanage from help alliance, Lufthansa’s non-profit employee organization. The help alliance organization has been around for more than 17 years. It is committed to ensuring that more people on our planet can decide for themselves how to live their lives. The result of the 13 Lufthansa-founded associations: More than 140 successfully supported aid projects, more than ten million euros in donations – in addition to emergency aid provided in the event of various natural disasters. 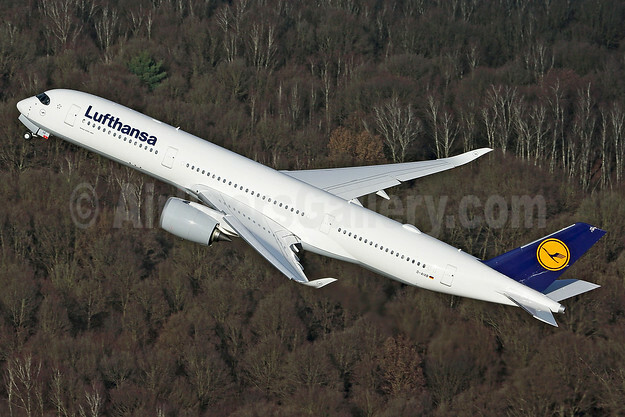 Copyright Photo: Lufthansa Airbus A350-941 D-AIXA (msn 074) TLS (Eurospot). Image: 936200. This entry was posted in Lufthansa and tagged A350, A350-900, Airbus, Airbus A350, Airbus A350-900, Airbus A350-941, D-AIXA, Lufthansa, msn 074, TLS on December 21, 2016 by Bruce Drum. On December 19, 2016, the Lufthansa Group will receive its first Airbus A350-900, which is the most modern long haul aircraft worldwide and which will be based at Lufthansa’s Munich Hub. The first regular commercial flight will be from Munich to Delhi on February 10, 2017. Once Lufthansa has taken ownership of the aircraft on December 19, the A350-900 will be transferred to Munich during the week leading up to Christmas. Lufthansa Technik in Munich will then install the cabin interior including the new Premium Economy Class as well as other features so that the new flagship aircraft will be ready to be presented to the public at the beginning of February. This entry was posted in Lufthansa and tagged 074, A350, A350-900, A350-941, Airbus, Airbus A350, Airbus A350-900, D-AIXA, Lufthansa on November 18, 2016 by Bruce Drum.